Jesse Alexander (Born 1929) has been involved in photography for several years; especially motorsports photography that he has been involved in since the early 1950s when he covered the original Mexican Road Race. Alexander spent several years in Europe where he was covering the famous long distance sports car races, Formula One, and the 24 Hours of Le Mans, the Targa Florio and Mille Miglia. During that time he also photographed music and theater personalities for the New York Times. As a young boy growing up during the Second World War, Alexander was captivated by the imagery that came out of the war through the eyes of W. Eugene Smith, Edward Steichen and other legendary photographers like. His other heroes include Robert Capa, Bruce Davidson, Mary Ellen Mark, Jacques Lartigue, and Henri Cartier Bresson. His work has been exhibited in museums in the US, including the Akron Museum, the Birmingham Museum of Art, and the Santa Barbara Museum of Art. His work is held by numerous private and corporate collectors. Alexander’s current body of work includes travel photographs of the Galapagos Islands, Iceland, and birds. 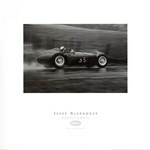 Alexander's archive of motorsports photography provides a thrilling insight into the Golden Age of racing. His career as a photographer began when he went to shoot the original Carrera Panamerica in 1953 - widely considered the world’s most dangerous road race. Here he met famous drivers including Eugenio Castellotti and Juan Fangio. Alexander returned to United States in the late 1960s. 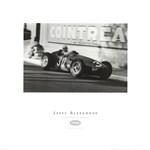 He went to Monaco to photograph the Grand Prix for the first time in 1955. Alexander’s photographs of the spectators, cars, races, and drivers capture the glamour and excitement of these events which are hugely popular.